I don't know everything, but I'm learning, have great resources, and want to help. Being a Homemaking Diva is fun! Well, nervous as I am, things seem to be coming together. My procedure is set for Monday afternoon. It will be fine, it's just never fun facing this kind of thing. I feel as though I have left my colleagues in a good place with what I accomplished this week at work. At home, I'm caught up on laundry and almost caught up on the dishes (and I still have all day tomorrow). I have a meal plan made up that is full of easy options that my husband will have no problem pulling together himself until I'm back in the saddle. I've done a little extra decluttering and cleaning this week, not as much as I should in a 'normal' week, but this week was not normal. I'm even all caught up recording our receipts in my budgeting system and we have cash on hand to cover the ridiculous parking fees at the hospital. All that's really left to do is to pack. I've been thinking about it a little and I believe I have a good idea of the bare essentials that I want to bring. I'll take care of that tomorrow. Praying for peace and a speedy recovery. Thank you for joining me on my journey as a Homemaking Diva!! Well, it's that time of the year again! Everyone has resolved to get fit, get organized, etc. Me? I am working on getting organized again, but I have alternate motivations. I have some medical stuff coming up and I won't be able to do much for a few weeks, so I would like to have things mostly in order beforehand, both at home and at work. It's funny, I've been following different organizing, homemaking, and productivity sites for years, so I've heard so many strategies and tips.... they all seem very repetitive sometimes and I start to see the patterns most of them use. That being said, all the information in the world is useless if you don't apply it! So it's January 1st and I'm jumping on the bandwagon with so many others, and there's nothing wrong with that. The main focus is baby-steps to avoid crash-and-burn. I don't need to be Wonder Woman, I just need to be me. It is also important that I spend some time with my husband, and since I work full-time, I need to take small organizing projects here and there, so I'm not spending all of my home-time ignoring my family. I'm going to work through 3 main systems and incorporate them into my life with baby-steps and all of the general knowledge I have. Taylor from Home Storage Solutions 101 has a Facebook group called Declutter 365 that I am a part of. I joined sometime in December with the intention of starting today. She has created calendars with daily missions for decluttering and links to more detailed information. And there is a great community on the Facebook group that talk about each mission, ask questions, and share their accomplishments. Flylady, of course. I had definitely fallen off this bandwagon, but I'm working on baby-stepping my way back. Her set up is a great system of routines and encouragement. The only problem I've ever found with it was incorporating her zones into the layout of my house, which is quite different from her 'norm', but all it really took was a few minutes to sit down and figure out how to mesh it together. The Secret. Lol! I'm also part of a 'secret' Facebook group that is a spinoff of a forum I used to be on. I'm making the commitment to join in on more of those conversations for the community, encouragement, and accountability. I wish progress was going a little faster, but at least it's something. The process with the insurance company seems to be dragging out a lot longer than it should, but we will get there eventually. I'm currently working on setting up the new computers, figuring out Windows 8, and reconstructing the information from our budget spreadsheet. Christmas is coming at the same rate, regardless of my situation, so I'm starting in on "all that stuff" also. My sister was over last weekend with her kidlets, who thoroughly entertained "Uncle Mark" while she and I did some baking. The kids helped some and we got done what we wanted to. Our family has traditional Christmas 'goodies' that we like to have each year. So my sister and I have developed a chart with recipe names across the top, ingredients down the sides, and amounts filled in the middle. The amounts for each ingredient are totaled in one column and then each is assigned to one of us. We each contribute some of the ingredients and split the goodies when we are done. Do you get together with anyone for Christmas baking? Do you do a cookie exchange? Comment on the Homemaking Diva Facebook page! Thank you for joining me, it really is fun to be a Homemaking Diva!! Life can really be complicated sometimes. When you concentrate on one area of your life you can do good there, but then, I find that other things start to slip. Add in some outside attacks and, all of a sudden, your house looks like a tornado hit it.... or is it just me? I started working as an Administrative Assistant for The Salvation Army about a year ago. And it is fantastic, I love my job. However, I am still trying to get into a reasonable home-life routine where I still have take the time to do some extra housework in the evenings and weekends. We've been scraping by OK and my husband is great, but I often feel like I should be doing more. Add to that the fact that someone broke into our house last week, and now it seems that much worse and that much more noticeable. Not only did some stranger violate our home and cause damage and steal things, but we've had the police over a few times, the insurance company sent a contractor over, I had my brother-in-law come (as he is also a contractor) and pretty soon, the workmen will be here to fix things.... that's a lot of people coming and going, and things are definitely NOT "company ready" around here. Oh well, what can you expect, really. I do have a good reason for being so distracted. I believe I have most things organized for the insurance people, we're just waiting on a little paperwork and then we should be able to have the repairs done. Now is the time to take inventory and move forward. With baby-steps I can make good progress on the house and soon I'll be able to add some Christmas prep work! It really is fun to be a Homemaking Diva!! First off, I have to tell you, yes, in my opinion, it is still way too early for Christmas decorations and music. But, now is the perfect time to plan! It's mid-November, craft shows are in high gear and we're starting to get into make-ahead season. Now is the time to set aside some extra time and some extra money (if you haven't already) to make sure that Christmas doesn't surprise you. How much money do you plan on spending on gifts? What might you get for each person? Are there any crafts you need to get going on? How many get-togethers do you want to go to? Are you hosting any of these get-togethers? What goodies are you going to bake? What baking can be made ahead? And don't forget your family traditions! 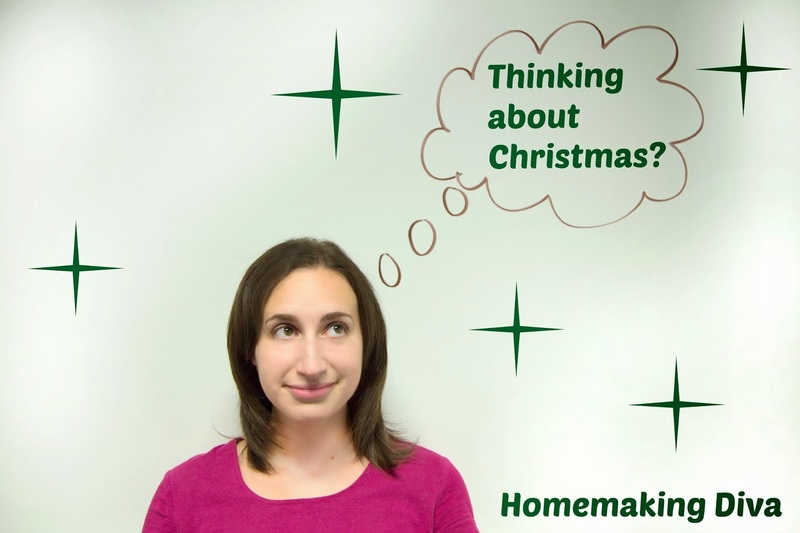 November is a great time to get started on crafts and baking. A friend of mine has a craft show every year with her mother and one or two other vendors. I always go and usually get all my stocking-stuffers there. My sister and I bake together, and we had our first session on Saturday. It was extra fun this year because now my seven-year-old niece is old enough to help (not just busy-work 'help' but actually help). We make our list, pick our dates and split the groceries. It's always a lot of fun. If you start planning now, you can beat the rush and avoid the malls on crazy December Saturdays. If you can swing it, try going on a weekday-day during November to get a head start on your gift buying. Thank you for joining me, and I hope I can help you! It really is fun to be a Homemaking Diva!! 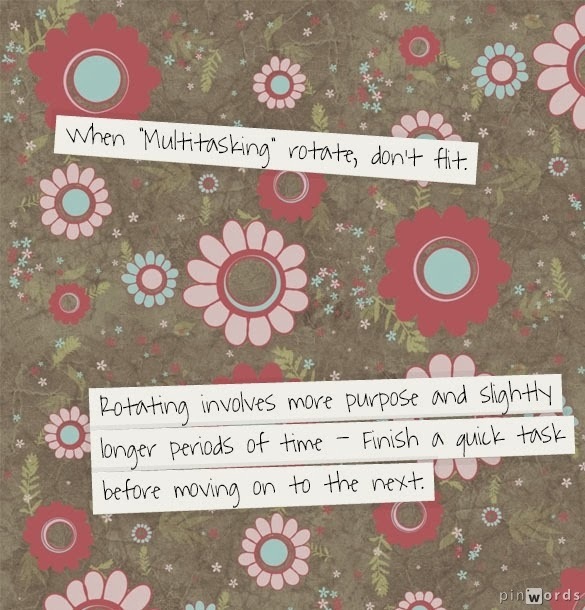 Breaking the Multitasking Myth: Rotate, don't flit! Multitasking is a very popular buzzword, but it is a lie. Humans actually cannot multitask efficiently. Multitasking means "to work at several different tasks simultaneously" and while, yes, I am thinking, breathing, and typing all at the same time in this moment, I am really only blogging. Breathing doesn't require thinking, so it doesn't count. And I'm thinking about what I'm typing, so that is one task. Any complex task that requires thought is your current primary task. If my husband came into my office right now and started talking to me, he would distract me from my primary task (blogging) and I would have to wait until he was done in order to continue. I could try and keep typing while he was talking to me, but I would really be doing a bad job at each of the tasks (blogging and conversation). The basic psychology is this: what we call multitasking is really "switch-tasking" (because you actually can't do two thinking tasks at once). And each time you switch tasks, you actually lose productivity because your brain needs to remember where you were and what you were doing as you go back and forth. When "multitasking" rotate, don't flit. Be intentional about what you are doing in the moment you are doing it. When I sit down at my computer to "get stuff done" without a plan, I end up flitting around, doing lots of little things, but not actually feeling that I accomplished anything. I can spend hours online, know I was "working on stuff" but not know what I completed (if I completed anything at all). Flitting does not work. Instead, rotate! Rotating involves more purpose and slightly longer periods of time. Instead of going off on a tangent, ending up wherever your clicks take you, sit tight and complete one task before moving on. Use a time, a checklist, whatever tool that is a help you. Just remember to keep it simple. Decide what your goal is. Then finish one task before moving on the the next. Here's what this has done for me. In the past, I have found that checking twitter can be a multitasking black hole. People to follow back, links to websites to check out, articles to read, etc. My problem with flitting starts when I don't define what I'm doing. I click someone's profile to follow back and before I know it, I'm joining a facebook page and jumping over to LinkedIn. But when I decide to rotate, I know that I'm not looking at everything right now. I'm just following people back on twitter. If I see an interesting link, I'll open it, but not look at the page yet. I keep going inside twitter until I'm done with twitter and then quickly look at the other links I've opened to see if I want to do anything with them. Sometimes they're short articles and I'll read them then and there and sometimes they're something longer and I grab the link and make a new to-do in Asana to check on later. And the good news is, that when later comes around (and I use due dates, so it does come around), I am more objective and can prioritize better. So instead of reading all of the somewhat interesting articles I find right away, I only end up reading a few of them later. A new year is a fresh start, resolutions, commitments, goals - all are floating through our heads. Yet, I'd like to caution you not to go overboard. The stereotypical 'get fit' resolutions that translate into 'go to the gym twice in January' resolutions are basically useless. We put too much pressure on ourselves, push really hard for a short while, then 'crash and burn'. I'd encourage you to make smaller, incremental, resolutions. I got a great form emailed to me from Marcia Francois called '2013 Intentions'. She asked us to choose a word for the year. I chose 'peace'. I want to make a calm home where we can relax and enjoy life. By focusing on my 'word for the year' I can more clearly choose my goals to fit inside 'peace'. Naturally, clutter and chaos in a home takes away from 'peace'. So decluttering is on my list - my house definitely would NOT qualify for Hoarders but it can use some work. The main areas are decent but can be tweaked and the 'extra' rooms, especially 'my' rooms need overhauls. BUT, I don't want to crash and burn, so I'm baby-stepping it. Easy as 1, 2, 3! Knock out something small - Instead of writing down everything I can possibly think of to do, I'm spending some extra time flitting around taking care of the small tasks that don't take very long. Just 15 minutes - This one's ingrained in my from Flylady, you don't have to do everything, just work on it for 15 minutes and make some progress. You'll be amazed at what you can do in 15 minutes! Add to routines in babysteps - Don't add 25 things to your daily to do list today, add one thing and work at making it part of your routine, when you feel comfortable with that, add one more thing. Will you 1-2-3 with me? What is your 'word for the year'? Administrative Assistant for the Salvation Army, wife, scrapbooker, librarian, and organized person. More Fun Stuff With Me!